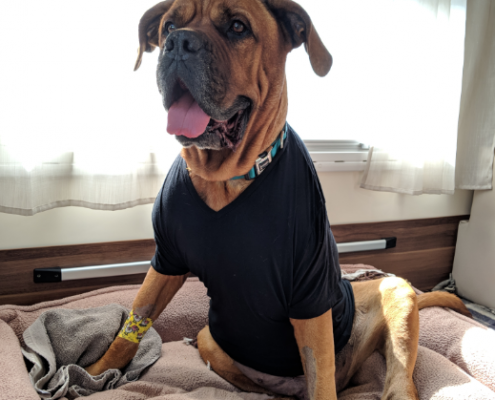 Bozo, a five year old Bull Mastiff, was unaware that spending practically all of his time in a car in a back garden with another Mastiff was not a normal situation. Fortunately for him this fact was reported to the RSPCA who took him into their care. Ten months ago he was rehomed to his current owners and is now enjoying the discovery that life has a lot more to offer than staring at a dashboard, this has included a nice jaunt down to Devon in a campervan two weeks ago. Whilst staying near Salcombe he had a day of not wanting to eat. At 3am that night he started to make all the movements and sounds of trying to be sick, but did not bring anything up. 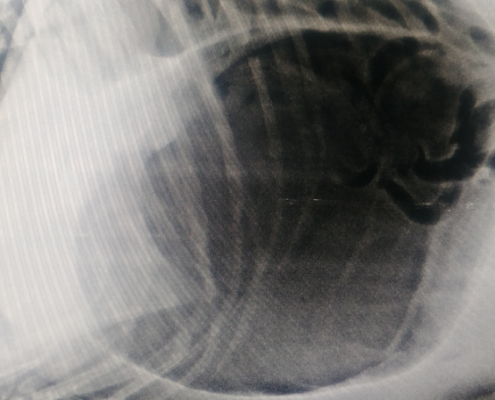 The owners knew that this may be a sign of something serious as they had been warned by the RSPCA that large dogs can get a condition called gastric dilatation and volvulus (GDV) – also known as bloat – so they immediately checked the internet for practices locally that do 24 hour care, and gave us a ring. GDV is a syndrome resulting from abnormal accumulation of gas (dilatation) which may precipitate rotation of the stomach (volvulus).The most common breeds affected are the German Shepherd Dog, Irish Setter, Great Dane and other giant breeds. .Bloat most commonly affects middle-aged or older animals. Dogs that are highly stressed appear to be more likely to develop bloat and there is in an increased risk in any dog with a close relative that has had this problem. The gas can be produced from the fermentation of food material in the stomach or from the swallowing of air. In normal dogs, burping quickly relieves the pressure in the stomach but in some dogs there is a problem that prevents normal emptying of the stomach. Gas continues to build up causing the stomach to inflate like a balloon. As the stomach swells it may flop over to one side. This can block off the exit for gases, making the problem progress more rapidly. The stomach can also twist on itself, which is quickly life-threatening. Generally the first signs noticed in a dog affected by bloat are restlessness coupled with retching and drooling of saliva. The dog may show attempts to vomit but only a little frothy foam may be produced. The abdomen may become swollen and firm to the touch (although this isn’t always obvious). Affected dogs may look at their sides or show other signs of abdominal pain. Some dogs may cough and others want to drink a lot of water. As the condition progresses the dog may have difficulty breathing and eventually will collapse and be unable to get up. If untreated, dogs that develop a twist in the stomach will die. Bozo was seen by Amy Combes, who could see from the X-Ray that the stomach had twisted. Bozo was put on intensive fluid therapy and the gas was removed from his stomach, which was then untwisted. Part of the stomach was then permanently attached to the body wall in order to reduce the possibility of a recurrence. After the operation he recovered well and could be discharged the following day. He was driven straight back home and his owners have let us know that he continues to do well.